Georg Jensen beaded fruit knife. Measures: 17 cm. Stamped. Designed in 1916. In excellent condition. 3 pieces in stock. Georg Jensen Pyramid fish knife in sterling silver. Designed by Harald Nielsen. 2 pieces in stock. In perfect condition. Measures: 20 cm. Stamped. In very good condition. Georg Jensen silver Bernadotte fish knife. Measures: 20 cm. In perfect condition. Early stamp. Georg Jensen. Cutlery, scroll no. 22, hammered sterling silver. Fruit knife. 6 pieces in stock. In perfect condition. Stamped. Measures: 16.5 cm. 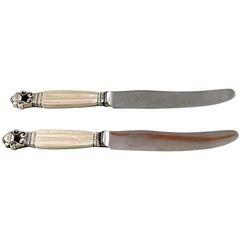 &quot;Acorn&quot; silver cutlery Georg Jensen two fruit knives. Measures: Length 16.5 cm. Early stamp. In perfect condition. Georg Jensen Sterling Silver Pyramid Cake Knife No 196. Measures 24.2 cm / 10"
Georg Jensen sterling silver beaded fruit knife all silver. Measures 16.2 cm / 6 3/8 in. Design Georg Jensen 1916. Georg Jensen sterling silver Acadia fruit knife #072. Measures: 16.5 cm / 6 1/2 inches. Georg Jensen sterling silver acorn fruit knife #072. Measures17 cm / 6 3/4 in. Design Johan Rohde. Georg Jensen sterling silver beaded cheese knife. Measures 14.3 cm / 5 5/8 in. Design Georg Jensen, 1916.